Poor broadband speeds are often cited as a major stumbling block as broadcasters push to move content online. It was one of the points repeated raised during last year's BBC Three consultations and was one of the factors in the decision to make the BBC repeat all BBC Three Online content on BBC One and Two. Now, Openreach, BT’s local access business, has announced plans to connect more consumers to ultrafast fibre using its open access network. It follows strong criticism of the company's performance in recent weeks. Openreach will build on trials of ultrafast ‘G.fast’ technology with new pilot sites in Cambridgeshire and Kent. It is also committing to build faster Fibre to the Premises 'FTTP' infrastructure into new housing developments in the UK that have more than 250 premises, free of charge. FTTP will bring some of the fastest speeds available to households, with speeds up to 1Gbps, whereas the current Fibre to the Cabinet (FTTC) service offered to the majority of fibre broadband customers is constrained by the copper wire between the local street cabinet and the house. G.fast technology could increase the speeds available via FTTC to 300-500Mbps. Currently, households may achieve download speeds of just under 80Mbps if they live in close proximity to an Openreach street cabinet and subscribe to a top-tier fibre broadband product. “The UK is a leader when it comes to superfast broadband. Nine out of ten premises have access to fibre today and this will grow to 95 per cent by the end of next year – but I want to get high speeds to everyone, so we’re also developing solutions for the final five per cent of the country. Traditional broadcasters, especially the BBC, are seeing online distribution as a significant part of their future; it can be cheaper for broadcasters to share content online, and some of the costs of distribution are pushed onto to internet service providers and consumers, rather than the free-to-receive option offered by terrestrial and satellite broadcasts. All major satellite and terrestrial platform operators are increasingly looking at a hybrid model, with traditional TV services continuing to be delivered via their existing platforms, with online delivery providing enhanced viewing options, such as BBC Red Button+ streams, catch-up TV and general on-demand libraries of TV shows and movies. But a significant number of viewers still feel locked out of this revolution thanks to sluggish speeds and delays in rolling out faster broadband, especially in some rural areas. For BT, the roll-out of faster broadband will give the company more coverage for its TV and especially UHD TV service, putting its technical reach further ahead of Virgin Media, although other online TV services, such as Sky Go, Now TV, Netflix, Amazon Prime and TalkTalk TV will all benefit from BT's fibre expansion plans, with other broadband providers able to offer ultrafast services to households via the Openreach network. It's no surprise that much is now being said about fibre broadband coverage and speed boosts: BT is now under pressure to prove Openreach is up to scratch, and is investing in UK broadband infrastructure for the benefit of all ISPs and customers, otherwise it may face a renewed attempt to split Openreach from the rest of BT, something that was narrowly avoided in recent weeks. So where in Cambridgeshire is the G. Fast trial? Since I live in the area I'm interested. Ah, Huntingdon I see. Again. Huntingdon always gets each new speed increase many years before anywhere else in Cambridgshite. And since it's a unitary authority and not part of any of the district councils, most people round here tend not to think of Huntingdon as being in Cambridgeshire anyway. Cherry Hinton, Cambridgeshire and Gillingham, Kent. I'm not in Cherry Hinton. But all the news articles I was able to find online say Huntingdon. Strange. "Having already committed to delivering ultrafast broadband to 10 million premises by 2020 and to the majority of the UK within a decade (subject to a supportive regulatory environment) Openreach is also building on its G.fast technology trials with two new pilot sites in Cherry Hinton, Cambridgeshire and Gillingham, Kent. Work on the pilots will begin soon. Once the infrastructure has been built, 25,000 homes and businesses in these areas will be able to access download speeds of up 330Mbps using G.fast from their nearest street cabinet." Same old story then - just as what we think to be a decent speed becomes available to the majority (but far from all) of the nation a new development sees a new top speed arrive which ultimately renders the current top speed to be the equivalent of dial up. Well this is good news from BT for a change! I just hope that the whole thing goes far enough and they see there is a need for the whole country to be on FTTP and the copper to be a thing of the past! 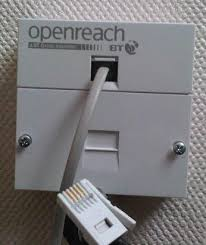 They can easily create a phone line connection from a splitter box that also changes the internet connection from fibre to cat 5 within the premises. If that happened for everyone it would be good news. The box would need good rechargable batteries though, so it would last at least 24 hours if a power cut occurred! But that's another matter. Fast Internet that's what this country needs now, for everyone.